Home - Multimedia - Repository - Software Packages - Ubuntu 10.04 Lucid Lynx - Ubuntu 8.04 Hardy Heron - Ubuntu 8.10 Intrepid Ibex - Ubuntu 9.04 Jaunty Jackalope - Ubuntu 9.10 Karmic Koala - Noteedit, il programma migliore per scrivere spartiti musicali. Noteedit, il programma migliore per scrivere spartiti musicali. 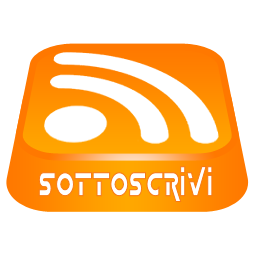 Al momento il programma migliore per scrivere spartiti musicali è senz'altro Nted o Noteedit. Si tratta di un programma di notazione musicale molto potente, continuamente aggiornato e abbastanza maturo. Le caratteristiche di cui dispone lo rendono facile e comodo da usare, ad esempio è possibile inserire le note con il mouse o direttamente da una tastiera MIDI comptaibile con GNU/Linux selezionando, nello stesso tempo, la durata delle note dalla tastiera del PC. Tra le altre cose, Notedit supporta numerosi formati di stampa tra cui lilypond, MusiXTeX, PMX e quello nativo e compatibile con Mup, un programma di notazione musicxale molto diffuso. La documentazione completa la trovate in questa pagina. Inoltre quest'applicazione garantisce supporto completo per il formato MIDI, infatti è possibile ascoltare immediatamente le composizioni utulizzando un expander esterno o un sintetizzatore software (softsynth). Infine, Notedit offre anche la possibilità di esportare il contenuto dello spartito in un file MIDI, caratteristica che lo trasforma in un ottimo sequencer. Insertion/deletion/modification of notes, rests (and multirests), ties/slurs, stem/beam control, instrument changes, repeats, clef/time/key/volume/tempo and all other classical music notation signatures. Dynamic expression markings ((de)crescendo, octaviation, arpeggio, fermata, trills, grace notes etc.). Fixed expression markings (staccato, sforzato, portato, strong pizzicato, sforzando etc.). Multiple voices per staff (polyphony). Drum notes (including drum and bass drum clef). Flexible UI based on Qt/KDE. Supports zoom, multiple windows, many keyboard shortcuts, Konqueror embedding and other candies. Playback and other MIDI operations (reading and recording from MIDI keyboard) are done using TSE3 library. Each staff can have its own channel, own intsrument and own MIDI settings (reverbation, chorus). Currently played element is highlighted! Basic score layout operations (setting brackets, braces, score title, composer, copyright etc.). Many useful tools like automatic placment of bars, automatic placement of beams, transposition, copying&pasting of elements, optimization and resetting of accidentals, MIDI importing (or recording from MIDI keyboard) filters etc. Exports MIDI (using TSE3 library), MusicXML, ABC Music, PMX, MusiXTeX and LilyPond. 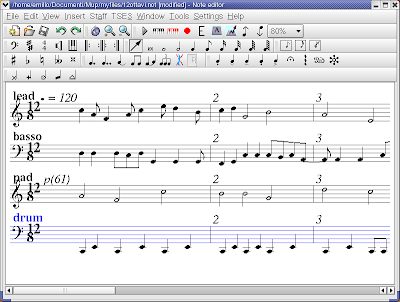 The NoteEdit fileformat is similar to the format of the music publication program (MUP). It's a plaintext format, with a simple syntax for describing the music, so computer geeks can edit it by hand if they want to:). NoteEdit is translated into the following languages: German, Spanish, French, Hungarian, Italian, Russian, Slovak, Slovene and Swedish. It supports UTF-8 encodings for lyrics, score title, composer, copyright and other document strings. When you start NoteEdit, a single empty staff if shown. No clefs, no signatures, no other markings. It's up to you to make the desired score and its structure from scratch. Configuration dialog allows you to change various NoteEdit settings like view options, editing style, colors, playback devices and more! You can change many staff properties like its name, MIDI instrument and other playback options, spacing in the workspace and transposition for non-C instruments in the Staff properties dialog! NoteEdit also supports polyphony! Here, you can create voices inside a staff and change their settings like stems directions and rests vertical alignment. Score layout dialog allows you to set the connectivity between staffs. By simply dragging and selecting desired staffs, you can set/unset a bracket, brace and measureline connectivity between them. Lyrics for vocal music is also supported! You can import lyrics from a text file or write the text yourself and assign it to a staff. You can have more than one stanza as well! If you want, you can open multiple windows of the current NoteEdit session. Like a composer, who uses multiple paper sheets on his desk, you can use multiple windows instead. Copying and pasting between the windows is fully supported! Thanks to KGuitar project, you can place chord markings and optionally their guitar diagrams as well! When editing the score, you can use a MIDI playback to hear your result. NoteEdit paints the currently played notes. 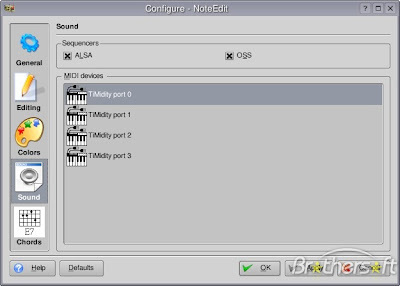 NoteEdit uses TSE3 cross-platform sequencer library for playback and other MIDI operations like MIDI file import/export, recording from MIDI keyboard, usage of various MIDI filters and similar. NoteEdit can also make a TSE3 score structure and exchange with other programs that are built on TSE3 library. 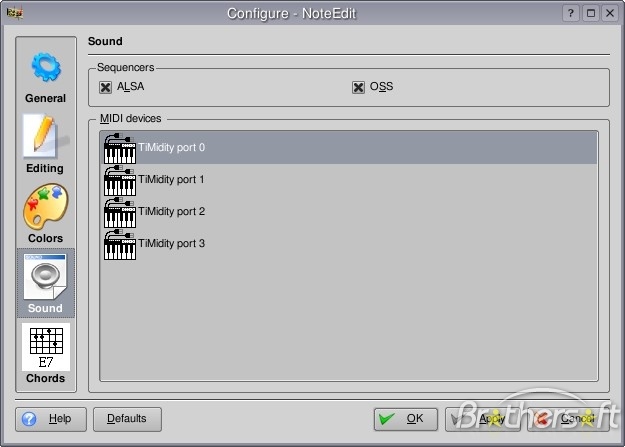 NoteEdit can import from TSE3, MusicXML and MIDI and export to TSE3, MIDI, MusiXTeX, ABC music, PMX, LilyPond and MusicXML. Here, you can see various export filter options. il miglior programma linux per editare spartiti è in realtà "muse score"
Non capisco come posso variare il tempo di esecuzione del pezzo.